I made my career in 2003. The idea I shared in 2003 wasn't ordinary or typical. And no one else was considering it at the time. Frankly, I was embarrassed to even bring it up with friends and family. I knew they'd look at me funny if I told them about it... So I didn't share it with many people. One person I did share it with gave me all the confirmation I needed, though. With just a few words, I knew I was on to a winning idea. You see, I began writing investment newsletters in 1996. My dad and I used to talk markets regularly. He'd tell me what he thought about all of my recommendations, good or bad. As far as I know, he bought everything I recommended... even the ones he didn't completely agree with. That is, until 2003 – the first and only time he put his foot down. He told me I had lost it... and that for the first time, he couldn't follow my advice. It was a bit of a shocker. But I wasn't worried... I was excited. I knew then that this idea would work out. It was so contrarian, even my dad couldn't get on board. To me, that made it as close to a "sure thing" as you could find in the markets. My recommendation back then was buying gold – gold coins in particular. And the investment did work out. It ended up soaring a few hundred percent. Again, this was hugely contrarian advice at the time. Gold had languished for decades. No one believed it was a wise bet. And few folks even tracked precious metals. With sentiment like that, I knew I was on to something... And Dad gave me the confirmation I needed. That big call on gold in 2003 made my career in a lot of ways. Not only did it give me huge credibility to thousands of readers, but it also brought in new readers who were excited to hear my next off-the-wall idea. Many of my biggest winners have come from the gold space. It's a corner of the market I track closely. If you've been following DailyWealth in recent months, it probably doesn't surprise you that I'm sharing this story now. It's because today, gold offers one of the best opportunities we've seen in years. The metal is completely hated by investors, as I shared in September. And in November, I explained that we could be at the start of an uptrend. That uptrend is official now. Gold broke out in a huge way last month. One simple way to measure this long-term trend is with moving averages. The 200-day moving average is a simple gauge of the long-term trend in any asset. 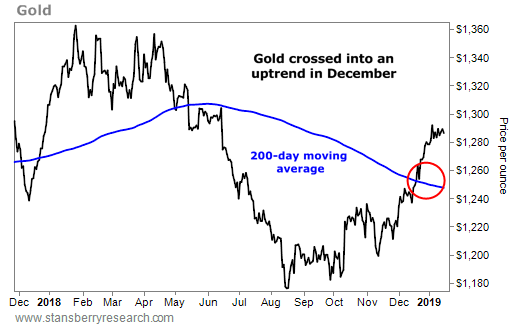 When gold is trading above its 200-day moving average, it's in an uptrend. This is huge news. It means owning gold is a safe bet. It means now is the time to put money to work. The simplest way to do it is through the SPDR Gold Shares Fund (GLD). This is a simple fund that tracks the price of gold. You can purchase it in any brokerage account. Recommending gold in 2003 made my career... And now, we have one of the best opportunities to buy gold since then. I strongly urge you to take advantage of it. P.S. Personally, I've been buying semi-rare gold coins. With gold near its most hated level in 17 years, I believe prices could potentially soar triple digits from here... And we could see huge gains in these assets during the next gold boom. I shared all the details of this setup with my True Wealth readers recently, including which coins I recommend today. To find out how you can become a subscriber, click here. "You won't see it in the headlines," Brett Eversole writes. "It won't be the talk of your next cocktail party. No one cares... And that's actually a good thing." Learn more about this quiet move in another forgotten precious metal here: A 'Silent Boom' Is Starting Outside the Stock Market. "I own gold and silver... and I urge you to do the same," Dr. David Eifrig writes. "But I take an unusual approach to my holdings." Read more about his contrarian way of holding precious metals – and why it's important to own these assets in any market – right here. 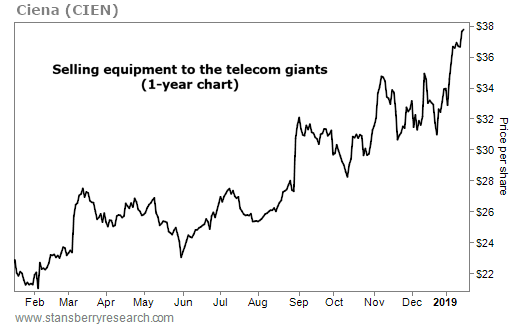 Ciena (CIEN) is a $6 billion telecommunications supplier. It provides the hardware and software that runs broadband Internet, cable, and telecom networks. Although you’ve probably never heard of Ciena, its partners include telecom giants like AT&T (T), Comcast (CMCSA), and Verizon (VZ). And as they compete for market share, this company just keeps making sales… Ciena recently reported sales of more than $3 billion for the fiscal year 2018, a 10% increase from 2017.